"I am very old, oh man of the waste countries; long and long ago I came to this planet with others of my world, from the green planet Yag, which circles for ever in the outer fringe of this universe. We swept through space on mighty wings that drove us through the cosmos quicker than light, because we had warred with the kings of Yag and were defeated and outcast. But we could never return, for on earth our wings withered from our shoulders. Here we abode apart from earthly life. We fought the strange and terrible forms of life which then walked the earth, so that we became feared, and were not molested in the dim jungles of the east, where we had our abode." 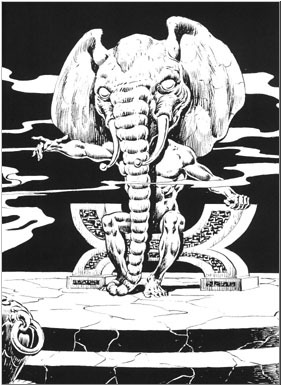 -- Robert E. Howard: "The Tower of the Elephant"
Face/Reach: 5 ft. by 5 ft./10 ft. Appearance: The elephant-beings of Yag are a race of winged, elephant-headed humanoids from another planet or dimension. They have green skin, topaz eyes, wide flaring ears, a curling proboscis and white tusks. Elephant-beings of Yag, due to their extreme longevity, usually learn to speak and understand most human languages. Combat: The elephant-beings of Yag rely primarily on their magical abilities in combat, although they will not hesitate to use their considerable physical strength if it seems appropriate to the situation. Smite (Su): Once per day, the elephant-being can make a normal attack and deal +11 points of additional damage to a foe. Spell-like abilities: At will -- arcane mark, cause fear, detect thoughts, dispel magic, shield, ray of enfeeblement; 7/day -- fabricate, major creation; 1/day -- limited wish. Special -- trap the soul (requires the sacrifice of a sentient creature of equal or greater Hit Dice than the target; note that the elephant-being can sacrifice itself to employ this power). These abilities are as the spells cast by an 18th-level sorcerer (DC 13 + spell level). Resistances (Ex): Acid, cold, and electricity resistance 15. Darkvision: The elephant-being has darkvision to 60 feet. Habitat/Society: Originally from the green planet Yag on the outer rim of space, a number of their race rebelled against their kings, but were defeated and cast out. They fled through space on great wings which carried them quicker than light, and came to earth before the rise of Atlantis and Valusia. They witnessed the Cataclysm and were worshipped as gods by the jungle-folk of the East. Ecology: The elephant-beings of Yag are not immortal, although their lifespans are claimed to be "as the lives of planets and constellations". Upon coming to earth, the race lost their wings and could not escape from the planet. As such it is a dead or dying race; Yag-Kosha was the only known specimen left alive before he asked Conan to kill him, thus releasing him from his earthly prison.